The second Monday in January is Seijin no hi (Coming of Age Day). On this day, all 20-year-olds across Japan celebrate the fact that they are officially and legally a part of the adult community. Coming of Age Day is celebrated only once a year so it includes all those who turned 20 since the previous Seijin no hi. On this day, the streets are filled with lovely young girls in beautiful furusode kimono rushing on their way to their first social events as adults. Of course, the boys also celebrate their entry into adulthood, but they are far less noticeable in their standard black suits. 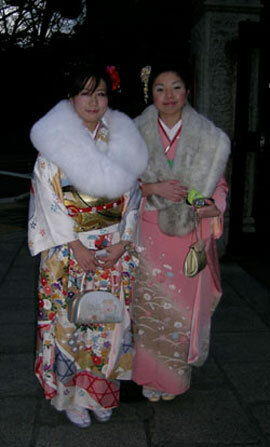 Furusode are a particular style of kimono worn only by single women. Furisode are distinguishable by their long sleeves, which average between 39 and 42 inches in length and reach nearly to the ground. The name furisode literally translates as swinging (furi) sleeves (sode) and the image of such sleeves is associated with youth and beauty. 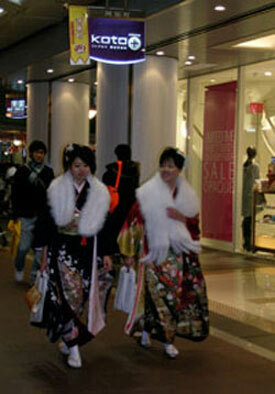 Furisode are also among the most decorative and brightly colored kimono, as befitting a young woman. Often the fans, flowers and other motifs are accented with rich embroidery and the wide obi belt is tied in an elaborately ruffled knot. With so many layers required to complete the look, kimono are quite warm, so even in January only a little fur stole is needed to protect against the winter chill. In an earlier time, a young woman would be photographed in her new furusode and the picture circulated to arrange a suitable marriage. After marriage, she’ll no longer wear kimono with such long flowing sleeves or such elaborately tied obi. The styles for married women are much simpler. Coming of Age Day also marks the end of the official New Year’s celebrations. Decorations have come down and most people have settled back into their work routines. Though the pace is winding down, there are a few last shinnenkai gatherings still going on. In fact, I have three more New Year’s parties scheduled for next weekend. 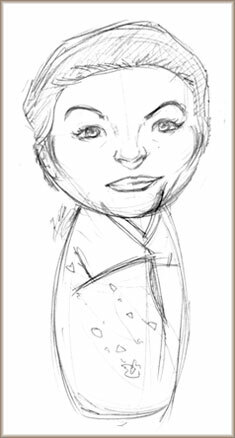 This entry was posted in holidays, kimono on January 16, 2008 by admin. Monday was my first day back at work after a lovely long week of relaxing my way into the new year. After days and days of preparations, the new year began with the bells at the Buddhist temples across the city tolling at midnight, 108 times for the 108 delusions that affect humankind. Many people stay up till dawn to see the first day break of the new year, some even hike up the hills surrounding Kyoto to view dawn from a mountain top. And then comes family time. New Year’s is a family holiday in Japan. I’ve been told that at breakfast on New Year’s day, many families have a ritual of thanking each member for what they have contributed to the family in the previous year. First prayers of the New Year are also significant. A visit to one of the many shrines and temples is often the first outing of the New Year. Fushimi Inari with its famous pathway under a succession of orange torii gates is a favorite site for New Year’s visitors as shown by the sea of people crowding the path in the photo above. 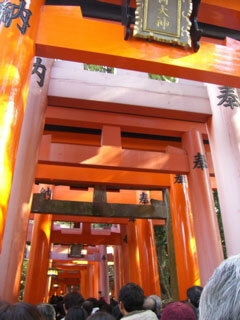 During the New Year’s holiday, several million people visit Fushimi Inari. 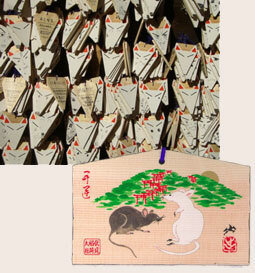 While there, people write their hopes and wishes on small decorative wooden plaques called ema, shown at right. Being an inari shrine, many of the wooden placques are shaped like a fox head, since foxes are regarded as a spiritual messenger of Inari. But for New Year’s, each shrine will issue a limited edition of holiday ema featuring the animal that represents the new year, for 2008 a mouse, and some image that reflects the shrine, in this case the path of torii gates. Each shrine offers their own special ema and often they become collectors items. For those who practice Chado, the way of tea, another important “first” is hatsugama or “first kettle”. 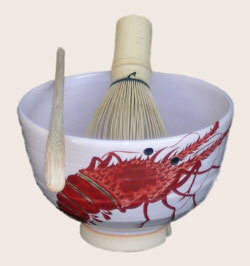 One of the most colorful and festive of Tea ceremonies, it is a time for using the most auspiciously decorated tea bowls, tea kettles, and other tools to create an elegant and welcoming celebration of the New Year. The lobster design on the cup at right serves as an indication of the luxurious sentiment that accompanies the first Tea of the New Year. Guests will dress in their finest kimono and the tea master will prepare the most elegant foods to accompany the Tea drinking. Of course, there are also many many gatherings that are less formal than Tea. Called shinnenkai (New Year ‘meetings’), they represent the first time friends get together in the New Year and will continue to take place throughout the month as people re-new and re-fresh contact with various circles of friends, colleagues and associates. But for now, as we come to the end of the first week of the new year, we arrive at kotohajime, the first day of work. For me, that was January 7th. 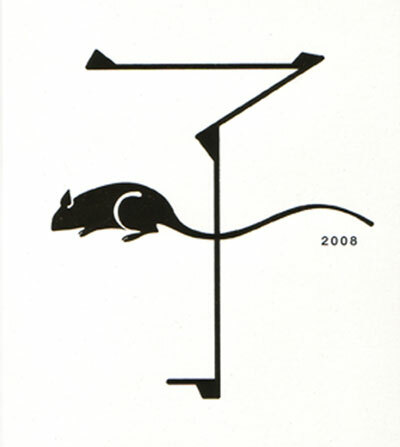 This entry was posted in holidays, Kyoto living on January 10, 2008 by admin. *Congratulations on the opening of the new year! This entry was posted in holidays on January 1, 2008 by admin.